Star Lift LLC can install commercial ramps to meet ADA compliance for public facilities. We make sure that commercial ramps adhere to width, handrail, and landing guidelines for proper usage. Material:We offer durable, rust-free aluminum ramps. Texture:Our aluminum ramps come in solid or mesh options. Color:Aluminum ramps can be powder-coated in the color of your choice. Ramps require minimal modifications to your home – but with your safety on the line, their installation shouldn’t be a do-it-yourself job. That’s where Star Lift comes in. We’re a locally owned and operated provider of ramps for residential and commercial properties in MN, WI, SD and ND. 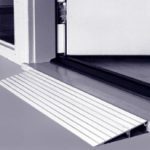 At no charge to you, we’ll come to your home, measure your entry or thresholds, and help you choose the best ramp option – one with a safe slope that fits your home and budget, in durable rubber or high-quality aluminum. All of the available options can be professionally installed within a few days. There are many types of ramps available. Star Lift LLC can provide manufactured ramps for each client’s needs. Contact us for an evaluation to help you determine what type of ramp will best suit the needs of your building.